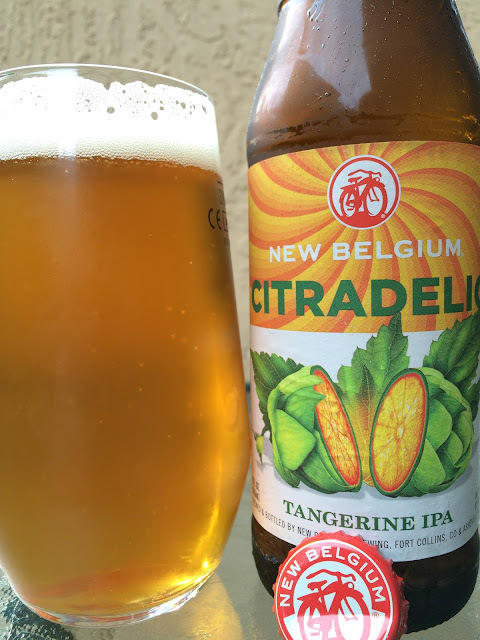 Today I'm checking out New Belgium's Citradelic Tangerine IPA. This IPA is brewed with orange, orange peel and tangerines. The sketch on the label depicts some rare breed of tangerines that grows with a bright orange inside and a hop cone sheath! "Expand you palate with a Citradelic experience." Enjoy By 15MAY16. 6% alcohol. Pleasant fruity aroma full of bright, zesty tangerines. Flavors are very orange forward, like an alcoholic orange ade. Very juicy with a nice fruity sweetness. Middle is spicy. Hoppy citrus, hints of grass. The orange is very dominant but contributes both sweet and bitter. Citradelic leans bitter as expected but is fairly neutral, especially for an IPA. Pretty good overall, and my wife drank the rest of the glass, so take that as a huge recommendation!